Dr. 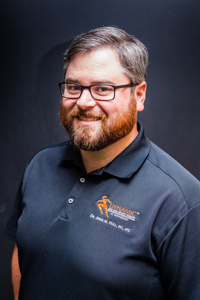 Hull is the founder of Dynamic Spine and Sports Therapy, and as summarized on Dynamic’s Meet Our Doctors page, he brings passion and years of experience to Dynamic’s mission. Dr. Hull graduated from Life University and specializes in sports medicine chiropractic. Using the latest proven approaches, Dr. Hull strives to offer the finest recovery experience through a global comprehensive approach to the entire body, not just the specific injured area. Dr. Hull is married and has two young daughters. His family enjoys outdoor activities such as hiking, running, and exploring all that the Atlanta area has to offer. He always strives to give back community by being involved in community activities. Dr. Hull is a member of the Cobb County Chamber of Commerce, as well as the Kennesaw and Acworth Business Associations. Kennesaw’s Dynamic Spine and Sports Therapy location is also in a certified LEED green building, which means it is not only energy efficient but also meets the specific requirements for clean and renewable materials – just one way to give back to the community. Dr. Hull’s passion is watching patients recover so they can perform at their best. Whether a professional athlete, a weekend warrior or someone who just wants to be able to hold their grandchild again – they can heal, recover, and get back out there.